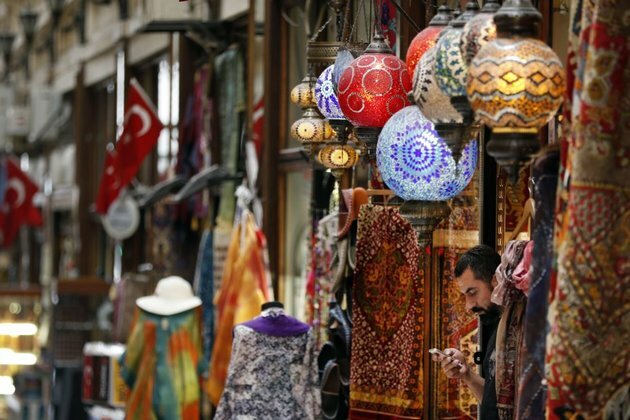 ISTANBUL - The Turkish central bank caught international markets by surprise Thursday as it aggressively hiked interest rates in an effort to strengthen consumer confidence, stem inflation and rein in the currency crisis. Interest rates were increased to 24 percent from 17.75 percent, which is more than double the median of investor predictions of a 3 percent hike. The Turkish lira surged above 5 percent in response, although the gains subsequently were pared back. International investors broadly welcomed the move. 'TCMB [Turkish Republic Central Bank] did show resolve in hiking the one-week repo rate substantially and going back to orthodoxy,' chief economist Inan Demir of Nomura International said. The central bank had drawn sharp criticism for failing to substantially raise interest rates to rein in double-digit inflation and an ailing currency. The lira had fallen by more than 40 percent this year. The rate hike is an apparent rebuke to Turkish President Recep Tayyip Erdogan, who has been opposed to such a move. Only hours before the central bank decision, Erdogan again voiced his opposition to increasing interest rates. The Turkish president reiterated his stance of challenging orthodox economic thinking, arguing that inflation is caused by high rates, although that runs contrary to conventional economic theory. Erdogan also issued a presidential decree banning all businesses and leasing and rental agreements from using foreign currency denominations. Turkish President Recep Tayyip Erdogan makes a speech during a meeting in Ankara, Turkey, Sept. 13, 2018. The central bank indicated further rate hikes could be in the offing. 'Tight stance monetary policy will be maintained decisively until inflation outlook displays a significant improvement,' the central bank statement reads. The strong commitment to challenge inflation was welcomed by investors. 'Most importantly, the CBT seemed to be vocal about price stability risks,' wrote chief economist Muhammet Mercan of Ing bank. Fueled by August's sharp fall in the lira, which drove up import costs, inflation is on a rapid upward trajectory. Some predictions warn inflation could approach 30 percent in the coming months. While international markets are broadly welcoming the central bank's interest rate hike, economist Demir warns more action is needed. 'This rate hike does not undo the damage inflicted on corporate balance sheet, and market concerns about geopolitics will remain in place. So this is not the hike to end all problems,' said Demir. The World Bank and IMF repeatedly have called on Ankara to rein in spending, which they say is fueling inflation. Perhaps in response, Erdogan has announced a freeze on new state construction projects. Investors also remain concerned about ongoing diplomatic tensions between Ankara and Washington. The two NATO allies remain at loggerheads over the detention on terrorism charges of American pastor Andrew Brunson. People stand outside an exchange office in Istiklal Avenue, the main shopping road in Istanbul, Sept. 13, 2018. Brunson's detention saw U.S. President Donald Trump impose trade tariffs on Turkey, which triggered August's collapse in the lira. Trump has warned of further sanctions. Turkey has a long tradition of carrying out business in foreign currencies to mitigate the threat of inflation and a falling lira. The growing danger of the so-called 'dollarization' of the economy and the public abandonment of the lira are significant risks to the currency. Turkish companies are paying the cost for the depreciation of the lira. Analysts estimate about $100 billion in foreign currency loans have to be repaid by the private sector in the coming year. Companies and individuals borrowing in local currency, however, will be facing higher repayments. And most analysts predict the Turkish economy is heading into a recession. Economist Demir says, though, that the situation could have been far worse. 'In the absence of an [interest rate] hike, the rollover pressures on banks would get even worse, damage on corporate balance sheets would intensify, and local deposit holders' confidence would have weakened further. So this hike, although it doesn't eliminate other risks, eliminates some of the worst outcomes for the Turkish economy,' he said. Thursday's rate hike appears to have bought time for the Turkish economy and the nation's besieged currency. Analysts say investors are watching to see if Turkey's decision-makers use that time wisely.